WELCOME!!!!!!!!!!!!!!!! Thank you for visiting my website. I am a member in good standing with the AACA(Authentic Artifact Collectors Association), ASO(Archeaological Society of Ohio) Fort Salem Chapter Officer, GIRS(Geniune Indian Relic Society), Central States Archaeological Society Green River Chapter, and various internet collector web-boards. My collecting philosophy is to move slowly and carefully. I will never be a high volume seller who picks up every piece that a buck can be made on. I sell pieces that I would put into my own collection. I enjoy the challenge of finding a perfect fit for my customers collections. 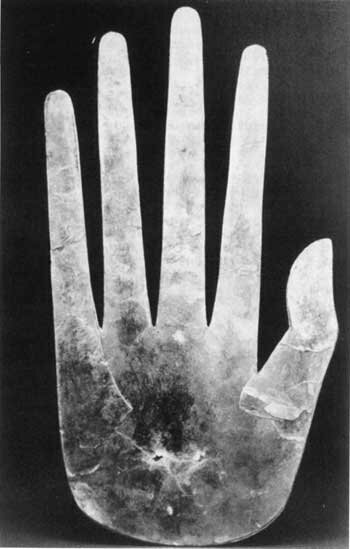 The Hopewell Hand - Cut from mica, this is perhaps the most powerful symbol of prehistoric North America.